I reviewed this one for Choice, which means that I had a 190 word limit. Cruel and unusual punishment for those of us who use 500 words just to clear our throats. Kane (Univ. of Pittsburgh) recovers the unique biography of an American stigmatic, Margaret Reilly (1884-1937). Raised in Manhattan to an Irish Catholic family, Reilly's body began bearing the marks of Christ in 1921, while she was on a spiritual retreat at a convent run by the Good Shepherd sisters in Peekskill, NY. Reilly soon joined the convent and assumed the name "Sister Mary of the Crown of Thorns." Some fellow sisters were suspicious of both her wounds and her supposed divine revelations from Jesus. But as word of Sister Thorn spread, she gained a following of lay and clerical Catholics. Her spiritual reputation expanded further as she embroidered Sacred Heart badges for friends and petitioners. 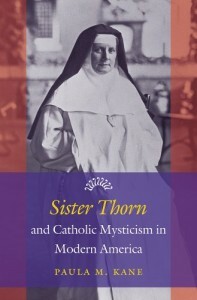 Attempts to canonize Sister Thorn ultimately failed. And questions linger as to the authenticity of her mystical wounds. But Kane's rendering of Sister Thorn's life and afterlife brings into sharp focus the story of American Catholicism in the interwar years, while foregrounding themes such as modernity, ethnicity, gender, authority, urbanization, and assimilation. The clarity and accessibility of the writing is exceeded only by Kane's expert analysis. Summing Up: Highly recommended. For this interview, I traveled to Pittsburgh and met Professor Kane in her office, which is in the famed Cathedral of Learning. This is one of those great Pittsburgh landmarks, an image that one conjures when thinking of the city--right alongside chipped ham and the Immaculate Reception. So it was a cultural experience, but also a terrific conversation.